Timely Crop Water Stress from Any Data Reader for Precision Irrigation. The Cermetek LeafMon-S Sensor Suite provides the grower with a physical measurement of water stress. LeafMon-S is compatible with any data reader supporting the standard SDI-12 interface. Armed with accurate Crop Water Stress Index (CWSI) data the grower can precisely manage irrigation and utilize strategic deficit irrigation techniques. LeafMon-S includes an opaque leaf dome, mounting arm, leaf IR-sensor, various environmental sensors, and a governing microcontroller. 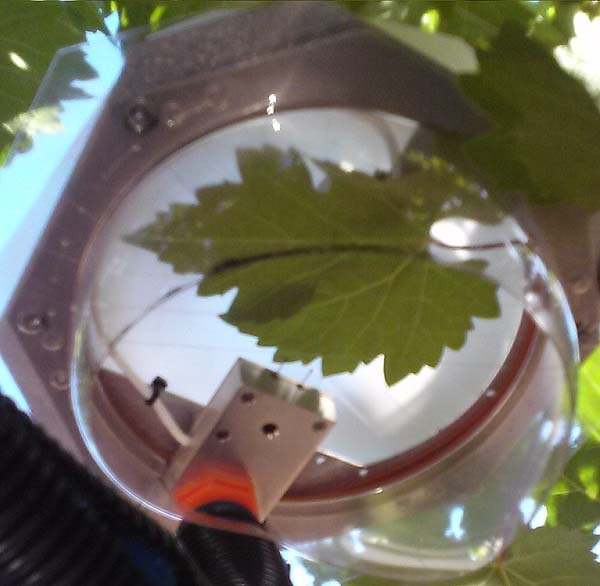 The leaf dome protects the leaf and properly positions the leaf, sensors, and associated electronics. The mounting arm securely attaches the sensor to the tree, vine or plant. The sensors monitor the leaf and environmental conditions. The microcontroller processes the sensor data, calculates the CWSI, and communicates with the data reader. In operation the microcontroller polls each of the environmental sensors each time the data reader requests a CWSI value. The microcontroller then calculates the current CWSI from those sensor readings and transmits the CWSI value to the data reader. Provides on demand monitoring of Crop Water Stress index (CWSI) via an SDI-12 Version 1.3 interface. Captures the monitored leaf in a semi enclosed dome to temper environmental variations and improve dependability. Utilizes multiple environmental sensors to calculate CWSI to insure maximum accuracy. Two sizes of leaf dome are available to support a variety of plants, trees and vines. All sensors are non-contact, non-invasive and do not harm the leaf or adversely affect plant behavior over the entire growing season.. Enables fully automated crop stress management for greater water use efficiency and sustainability. Eliminates trips to the field to test for stem water potential. Permits more precise management of strategic deficit irrigation for improved crop yield or crop quality. Will not damage the Leaf under test allowing the same leaf to be monitored for the duration of the growing season. Adaptable to any monitoring system supporting an SDI-12 Interface.